Imagine a maintenance tracking software system that automatically emails the maintenance manager when an equipment failure occurs of a specified magnitude. Consider how much time would be saved if your preventive maintenance system automatically issued all of the preventive maintenance work needed for the week. Would your purchasing manager like to be notified when a new requisition was submitted? Would the person requesting either parts or service like being automatically notified when actions were taken on their request? MaintSmart maintenance tracking software (version 5.0) fulfills all of the above and much more. With maintenance tracking software (CMMS) managing work order issuance and communications automatically the maintenance manager is freed up to perform other tasks. This saves time and money. Additionally consistency in communicating status changes, downtime and ordering is attained with no extra time commitment from the maintenance manager. Meters - a user defined unit. Example: Every 1000 Cycles replace gear lubricant. Calendar Date/Time. Example On the 15th of every month at 8:00 AM replace filters. Weekday/Time. Example: Every Monday at 8:00 AM print out weekly preventive maintenance needed. Additionally meters may be generated by linking the maintenance tracking software to the equipment on the plant floor. By doing so the equipment triggers the work orders automatically based upon equipment demand. 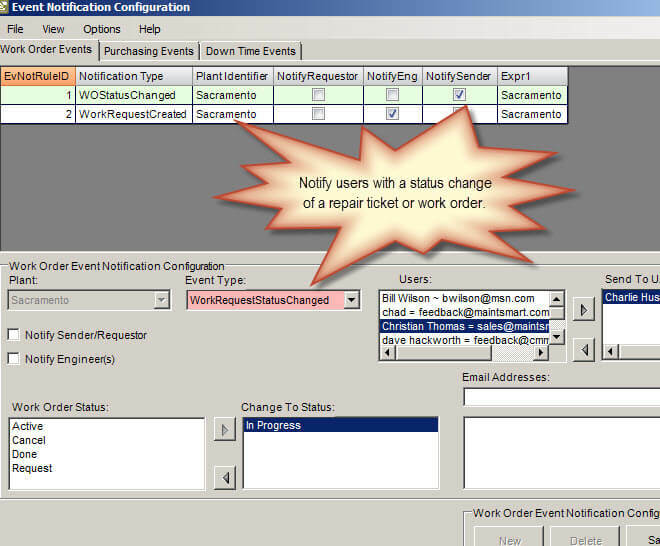 MaintSmart 5.0 maintenance tracking software offers the option to be notified when work orders, downtime and purchasing events occur.When an event occurs the selected users are notified by email within 1 minute. Work order or repair ticket is created. Work order or repair ticket status changes. Work order or repair ticket is edited in some other way. Downtime occurred or existing downtime record edited. Recipients of these notification is completely flexible providing configured email addresses of users, technicians, requesters, managers and arbitrary email addresses for special situations. Preventive maintenance is a key part of any maintenance tracking software. MaintSmart 5.0 offers a simple way to automated preventive maintenance assignment based upon date/time, day of week/time, day count interval/time. Filtered preventive maintenance assignments are automatically sent by email or printer to selected technicians on the specified period. These assignmants may be filtered extensively so that only the exact assignment needed is actually sent. For example perhaps only weekly preventative maintenance tasks for a particular technician that are coming due this week should be sent. Perhaps further filtering to include only certain equipment is appropriate. All of this is possible with MaintSmart 5.0. Best of all once the print/email job is configured it continues to recycle itself after each issuance. The Hot Sheet dashboard has been completely revamped in this CMMS software version. 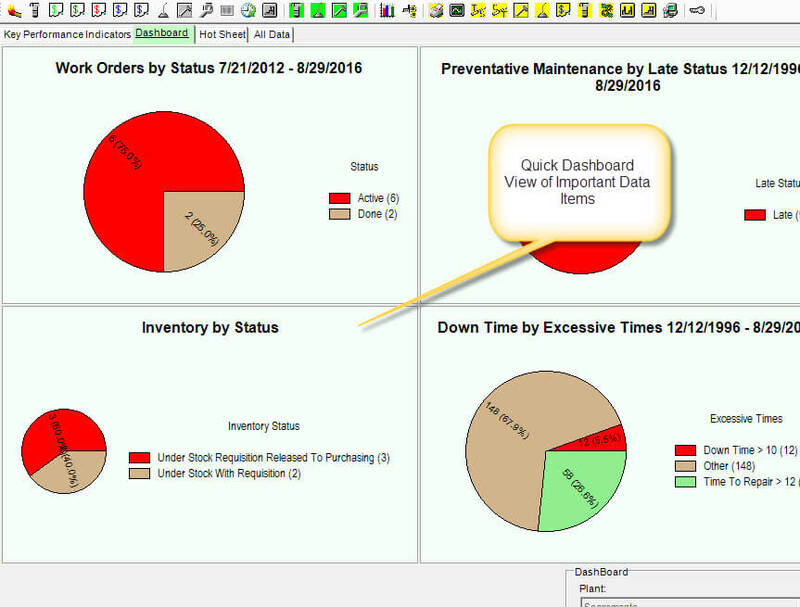 Tracking maintenance work orders, downtime, preventative maintenance and purchasing begins with a graphical, pie chart view of important maintenance management items. Clicking one of these charts opens the corresponding data reflected by this chart. This data is displayed in a tree view that lends itself to drag and drop functionality. Try out our Maintenance Tracking Software for a free 30 day trial. Schedule your own personalized web demonstration with the software running on our server.